Jerrie M. Cobb in Norman, Oklahoma is an American aviator. She was also part of the "Mercury 13", a group of women who underwent some of the same physiological screening tests as the original Mercury Seven astronauts as part of a private, non-NASA program. While still a student at Oklahoma City Classen High School, she earned a private pilot's license at the age of sixteen. On her 18th birthday, she received her Commercial Pilot's license and had added her Flight Instructor's Rating soon thereafter. During high school, she was barnstorming around the Great Plains in a Piper J-3 Cub, dropping leaflets over small towns announcing the arrival of an on-elephant circus. She slept under the Cub's wing at night and scraped together the gas money to practice her flying by giving rides. After high school, she spent a year in college at Oklahoma College for Women in Chickasha and also played semi-professional softball, but she made her living by crop dusting and teaching navigation. In the early 1950s, with so many male pilots who had returned from the war, it was nearly impossible for her to land a job as a pilot. She accepted a job at the Miami airport, where she met Jack Ford, a veteran pilot of WWII who had a service ferrying aircraft worldwide. By the age of 21, Jerry was delivering four-engine military bombers and fighters to foreign Air Forces around the world. She was well on her way to becoming one of the world's top pilots. Following a three-year romance with another pilot, which ended tragically with an explosion of his airplane over the Pacific, as a commercial pilot, Cobb set several world altitude and speed records in Aero Commander airplanes built by Oklahoma's Aero Design and Engineering Company. When she became the first woman to fly in the world's largest air exposition, the Salon Aeronautique Internacional in Paris, her fellow airmen named her Pilot of the Year and awarded her the Amelia Earhart Gold Medal of Achievement. Life Magazine named her one of the nine women of the "100 most important young people in the United States." She was also honored by the government of France. As the Space Age was beginning, Jerry Cobb was quickly gaining a reputation in the aviation community as one of the most experienced in the high performance propeller aircraft of her day. 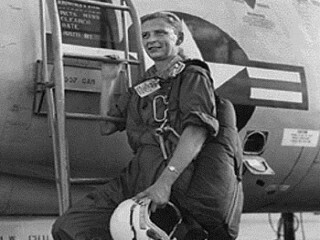 As America began selecting the first astronauts in 1959, Jerrie was picked by the Lovelace Clinic in Albuquerque to be the first woman to undergo the same physical and psychological fitness testing regimen as the Mercury Astronaut Selection Tests. After passing the tests with flying colors, Jerrie was asked to recruit 25 other qualified women pilots. Twelve passed the first series of tests. A year later, Russia sent the first woman to fly in space, Valentina Tereshkova, a factory worker. The American space program did not open the ranks of its astronaut corps to women until 1978. Setting her disappointment aside, Cobb resigned from her position with the space agency and became a private pilot using her flying talent to serve the primitive people of the Amazon jungle. For 35 years, she has found joy and delight in flying over the enormous uncharted jungle, bringing hope, seeds and help to her primitive friends. At age 67, Jerrie is in excellent physical condition and still flies professionally. As Senator Glenn recently returned to space, this courageous woman still hopes to fulfill her lifelong dream of flying in space. As she puts it, "I'd give my life to fly in space. I would have then, and I will now." View the full website biography of Jerrie Cobb.